Short dress in a flocking muslin. Its overlapped design with a v-neck and a bow around the waist makes of it an essential garment in your wardrobe. Midi long dress in a gauze flocated with black velvet polka dots, with round neckline and long sleeves. This garment fits to the body and ends in a sheer flounce. Lined with the same fabrics and closing at the back with an invisible zip. Dress in flocked cotton poplin. It's remarkable the pleated V-neck finishing in a great bow at the waist. Invisible zip at the back and linen in the same colour. Romantic style sleeveless dress in silk crepe with fitted bodice and an asymmetric peplum flounce around the waist with a lateral bow. Pencil skirt and slit at the back. It's lined in the same colour and it closes with an invisible zip at the back. If combined with a pamela hat, you'll be stunning. Emblematic dress in our firm, it stands out thanks to its elegance and simplicity. Made in silver crêpe, fitted aound the body with a back tail falling in cascade from the waist. It's remarkable the line of lined buttons on the back, form the back of the neck to he waist. Our designs breathe romanticism, elegance and subtlety and these reflect perfectly well what we are. Ainara is created out of a combination of muslin at the sleeves, ending in cuffs with buttons lined in the same fabrics, and silk crepe in the tight figure with a word of honor neckline. Midi long dress with v-neck and cut at the waist from which a pleated front goes up to the shoulder and falls backwards in a sort of half cloak. Lined inside in the same colour and closing with an invisible zipper. Bicoloured fitted dress in silk knit lined in the same fabrics, with round neck and long sleeves. It's a perfectgarment for any occassion, comfortable and versatile. Dress designed following the bicolor trends, with v-neck resulting of the combination of two strips entwined at the front. Made in silk weave and lined in the same fabrics in order to tight your figure. It's also remarkable its depp v-neck at the back. Midi length dress in silk crepe with long sleeves. It stands out thanks to its pleated v-neckline. This dress fits around the waist, from which a lateral flounce falls in cascade. Interior lining. Invisible zipper and slit on the back of the skirt. 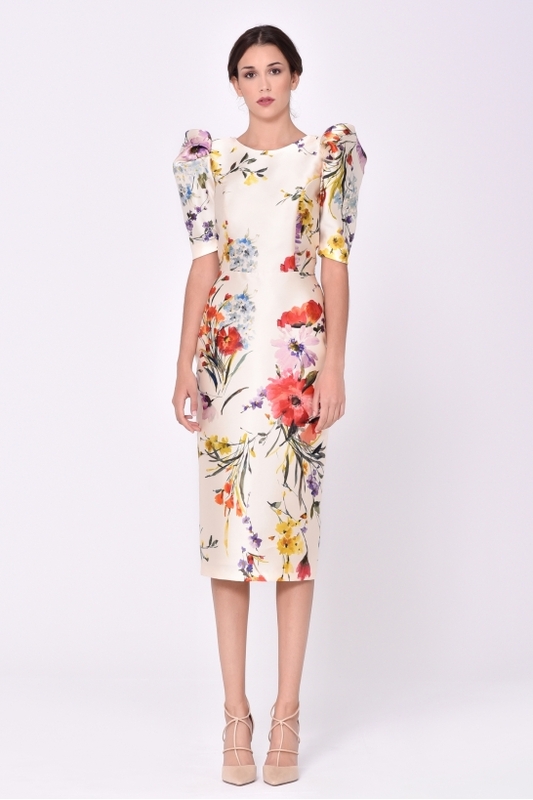 Midi long dress with a drop shaped neckline and cap sleeves. Waist accentuated by an asymmetric tail that falls in cascade. Made in an aquamarine cotton poplin printed with polka dots. Interior linen and invisible zip at the back. Midi long tight dress ending in a flowing frill that creates a suggestive movement. Round neckline, long sleeves and back that closes with an invisible zip. Interior lined in the same colour. Overlapped midi long dress in satin crepe, short sleeves and pleatings in the shoulder. V neckline and waist accentuated by a small bow. Fitted midi long dress with long sleeves. Its originality comes given by the satin bow at the end of its open back.Invisble zip and interior linen. Midi long dress with pencil skirt made in silk knit and waterdrop shaped neckline creating a gathering that finishes in an original bo around whe waist. Lined inside with the same fabrics. Midi long dress. It posseses a charming combination of colours and fabrics. Fitted body and skirt in silkk crêpe. Its fluid sleeves and back closing with handmade satin bows are made in a fine muslin. This design leaves us sleepless! Fitted long and straight dress with round neck and invisble zipper on the back. What we really appreciate in this garment is the elegant bow on the peplum flounce of its waist. Made in silk crepe. Asymmetric short dress in silk crepe pleated in the shoulder, from which a long bow in peau d'ange falls down backwards. Interior linen in the same fabrics and invisible zip at the back. Midi long dress in cotton plumeti. We love its embossed sleeves that end in a subtle satin bow, the same bow used to close the back. The pencil skirt has a slit at the back and the garment is lined in the same colour. Fitted midi length dress in silk crepe with round neckline on the front and back v neckline. Its spectacular nature comes given by its leg of muton sleeves made in satin piqué. Interior linen and invisible zipper on the back.